What is Intermodal Trucking and Why Does it Matter? As an industry professional about “intermodal trucking” and they’d probably point to one of those big containers that come off ships to be hauled away by an 18-wheeler. But the industry has evolved into far more than just getting the freight in an intermodal container from point A to point B. In fact, intermodal transportation has emerged as, perhaps, the most cost-effective system of moving freight. It drastically lowers the use of manual labor, reduces damage to goods and materials, and accelerates the overall shipping process compared to other methods. Intermodal transportation has helped the trucking industry shift from one filled with back-breaking loads and unloads to a technology-driven system. 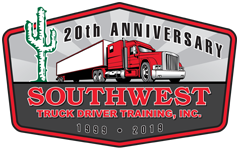 Drivers working in the industry today are earning upwards of $62,000 per year, especially with an education from a professional driving school like Southwest Truck Driver Training, offering locations in Tucson and Phoenix, Arizona and Las Vegas, Nevada. If that level of career opportunity and salary interests you and you don’t want to spend years in a college degree program, these are things you should know about a career in the intermodal trucking industry. The intermodal container revolutionized the industry because it created a sort of one-size-fits-all housing for the shipping of goods and materials. The overall freight industry has already made the necessary changes to move these containers on to trucks, cargo ships, and off-load them at their end destination. In many ways, the intermodal container is a massive version of the wooden pallet that was once the primary means to move goods around via forklift. Although pallets are still widely used, they often end up being run in and out of these massive metal containers. These containers allow companies to move items in greater bulk by using cranes to directly on- and off-load them to and from trucks. Professional drivers now tend only to handle the middle of the process. The large rectangular metal containers are loaded on to the trucks from rail or cargo ships in port. They are driven to a specific destination and then off-loaded by another industry professional. Once emptied, a truck will haul them to a location to be refilled. These days, drivers often never touch the freight they haul over the road. How Does Intermodal Trucking Benefit Drivers? According to industry resources such as All Truck Jobs, non-truckers have several misconceptions about the industry that could help them realize big benefits with a trucking career. The first think non-truckers don’t understand is the staggering number of jobs still available to them, even though intermodal transportation has streamlined the process and eliminated much of the trucker’s previous manual labor duties. Another misconception is that drivers do not necessarily have to be away from home for extended periods of time. The truck driver shortage is so pervasive that plenty of local and regional jobs are available that mirror typical 9-to-5 office work. Advancements in intermodal systems allow drivers just to pick up, deliver and go home at the end of the day in many cases. The rise in intermodal trucking as the primary method used in the freight industry has also brought repair shops under one roof. The fact that it ranks among the most pervasive ways to ship freight has influenced truck repair shops to tailor their services to intermodal trucking. The basic benefit to entrepreneurial truckers who own and operate their rigs is that repairs and maintenance can generally be done close to home or at most facilities if a break down occurs on the road. How Does Intermodal Trucking Benefit the Industry? Truck-to-rail systems require less fuel and are more cost-effective, emerging as a more “green-friendly” freight system. Widespread use of the intermodal container has resulted in improved dock and shipyard space for freight outfits because they can be safely stacked. Containers have also helped to improve logistics because they can be identified by markers and tracked through embedded technology. Packaging: Loads inside the container must be adequately braced and blocked to avoid material shifts and movement. Weight Disbursement: Loaders are tasked with even weight distribution to ensure load safety during the intermodal trucking process. It’s imperative that drivers only transport loads that are appropriately disbursed and meet federal weight guidelines. Safety remains job one in the intermodal trucking industry. The economy enjoyed tremendous growth in 2018, and that has had a profound impact on truckers. The country was already struggling with a truck driver shortage and demand appears to have maxed out the industry’s capabilities. Getting creative will only take freight outfits so far. At the end of the day, competition for valued truck drivers could create another pay spike. Many organizations are already working to recruit potential new drivers into their ranks. Given that many experts predict the economy will continue to expand and Baby Boomers will continue to retire at high rates, intermodal trucking presents a rare opportunity for young people to earn high salaries without the expense of a four-year college degree. South West Truck Driver Training offers cost-effective programs that can help people of all walks of life earn a CDL and start work in the intermodal trucking industry. It’s important to keep in mind that the significant driver shortage is expected to worsen and cause freight companies to compete for workers. It’s unusual to be heavily recruited for a job, but that is what the future of the intermodal trucking industry holds.